The SHOWTIME BOXING: SPECIAL EDITION tripleheader will air beginning at 9 p.m. ET/PT and is headlined by Claressa Shields battling Christina Hammer for the undisputed women’s middleweight championship. Franklin will face Rydell Booker while Wallin takes on Nick Kisner in a pair of 10-round attractions leading up to the main event. For both Franklin and Wallin, they see April 13 as a step towards their larger goals. A 25-year-old from Saginaw, Michigan, Franklin hopes to show that he’s primed to become the next American heavyweight champion, and is ready to take the mantle from current WBC titlist Deontay Wilder and the long line of American heavyweight champions that came before him. “I’m going to raise the competition amongst the heavyweights,” said Franklin. “The division is definitely back on the map and I’m planning on having a hand in making it must-watch TV once again. America needs another face in the heavyweight division and that’s going to be me. Although his native Sweden is not known for boxing, Wallin’s home country has previously produced a heavyweight champion in Ingemar Johansson, who famously stopped Floyd Patterson in their first fight at Yankee Stadium in 1959. 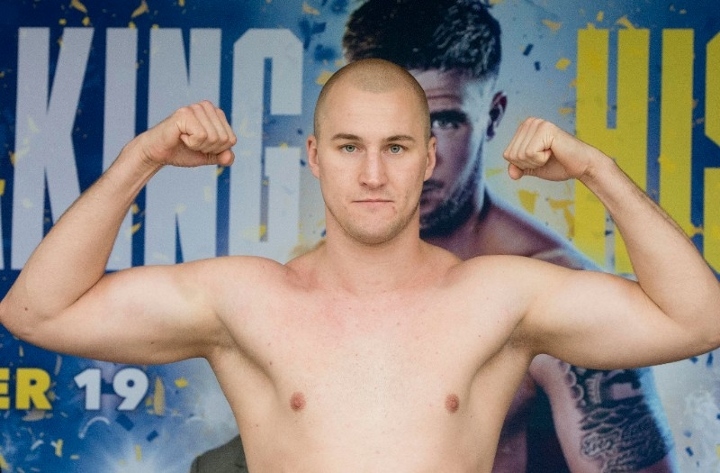 After defeating fellow Swedish heavyweight Adrian Granat in his last fight, Wallin decided it was time to fight in the U.S., following previous training camps in New York with trainer Joey Gamache. “Training here in New York brings me a great energy and it shows in my performance,” said Wallin. “It’s the center of the world, and while I’m fully focused on training, I feed off the energy of the city. In addition to being Wallin’s U.S. debut, the unbeaten heavyweights will make their first appearances on SHOWTIME and it will be Franklin’s first time fighting in the northeast. They each hope to show off their respective talents and are prepared for what comes with the increased platform. Both recently signed with Dmitriy Salita’s Salita Promotions and on April 13 will begin a year that could leave each fighter on the precipice of a title shot. “On April 13 two of the best heavyweight in the world, one from the U.S., one from Sweden, will both have a chance to make a claim that they are ready to challenge for the heavyweight title,” said Salita. “Jermaine Franklin is by far the best American heavyweight prospect who is soon to be a contender and a champion. He will have a great opportunity to showcase his skills and worth against the experienced, hungry and accomplished Rydell Booker. With this opportunity to announce themselves in the resurgent heavyweight division, Franklin and Wallin are keyed for eye-opening performances next Saturday. Hearn: Whyte Against Joshua is a F***ing Unbelievable Fight!